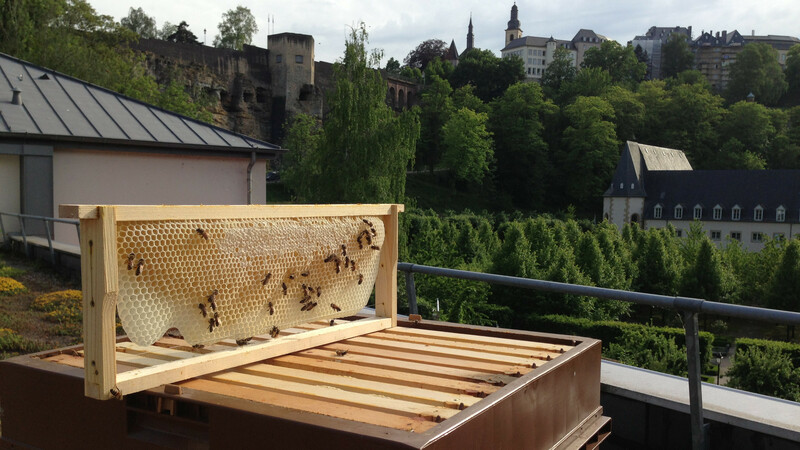 On my hostel’s rooftop, I want… beehives! Bee-cause bee-ing like everybody else is booring: let’s put beehives on top of our hostels! Why would a jacuzzi be acceptable and beehives, not? Exactly. The following information was gathered through survey with the people in charge of the project. To be honest, we first wanted to write a descriptive article, but the answers we received were so well-expressed and felt that we couldn’t afford to lose a single word of it. So here they are, presented as expressed by the projects’ leaders. When and how did the project start? 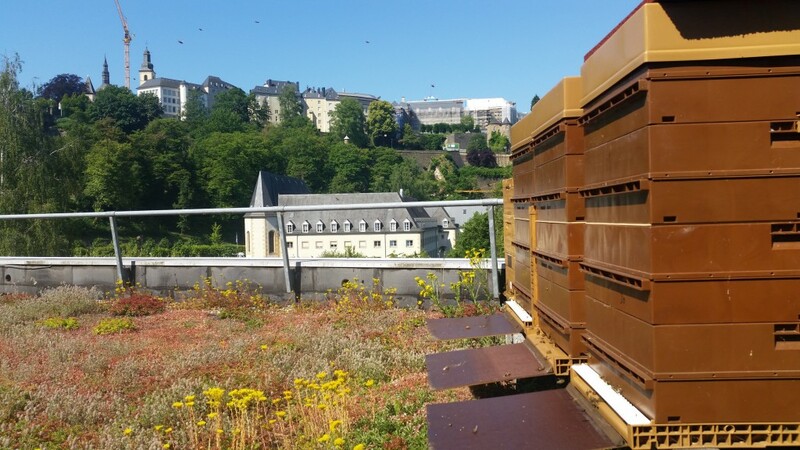 The manager of the Luxembourg City youth hostel had come up with the idea and subsequently went on to search for a local bee keeper to help us with the project. 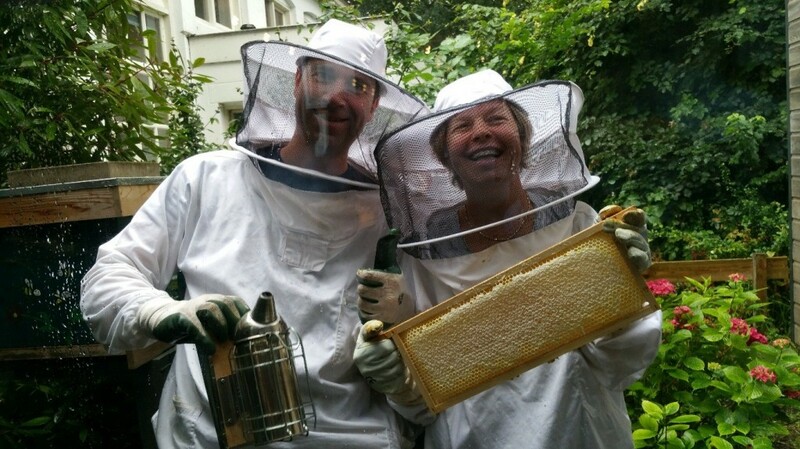 The beehives were placed on our roof in early 2013 and a few months’ later we already had our first honey. It turned out to be much less effort than we had anticipated. What was the initial aim? The plan ranged from raising awareness to supporting biodiversity. As a bonus, we get free honey to use in the restaurant or sell in jars, the proceeds of which help us maintain the project. Truth be told: It’s not profitable, but we break even. We do something good for the environment and it doesn’t even cost us anything! The beekeeper stops by for regular checks, maintenance, and eventually the harvest. Once the hostel gets the honey, its staff fills it into jars, labels them, sells them at the reception or passes them on to the restaurant. We rent the hives from the local beekeeper, and in return he gets part of the proceeds from honey we sell. It’s been working very well for both sides. How much honey are you able to produce with the hives? In total the four hives produce roughly 80 kg (176 lbs) of honey per season. What else than beehives can we find on your green roof? For now we only have some wild flowers and the beehives, but we plan on expanding our green roof in the coming spring by adding an organic herb garden for our restaurant and more flowers for the bees. What are the positive outcomes of this project? Above all, we have been overwhelmed with the positive feedback. Our first batch of honey sold out within days, much of which went to curious neighbours who were excited to buy something locally produced. As the project has also appeared in various newspapers, we certainly managed to raise awareness and perhaps even encouraged others to pick up beekeeping. Why do you think bees need protection? Like all animals, bees form an essential part of our ecosystem and furthermore play an underestimated role in plant diversity and pollination. 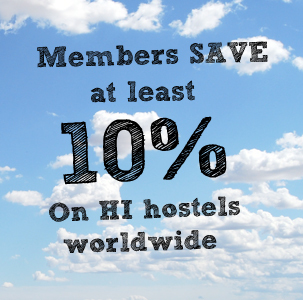 Does the hostel have any other sustainability projects going on? Plenty, and it’s something we are very proud of! All of Luxembourg’s HI Hostels are officially declared “Fair Trade Zones” and have been awarded the SuperDrecksKescht Label, a Luxembourg-based label dealing primarily with waste management. Furthermore, the youth hostel in Luxembourg City has received the golden “Eco-Label” badge for its exemplary sustainability efforts with regard to everything from recycling to energy saving. We also introduced Tuesday as veggie-day in order to demonstrate how easy it is to have a delicious, meat-free meal. In general, we feel the carbon footprint of meat is something that is not talked about enough. Yes: Don’t fear bees! 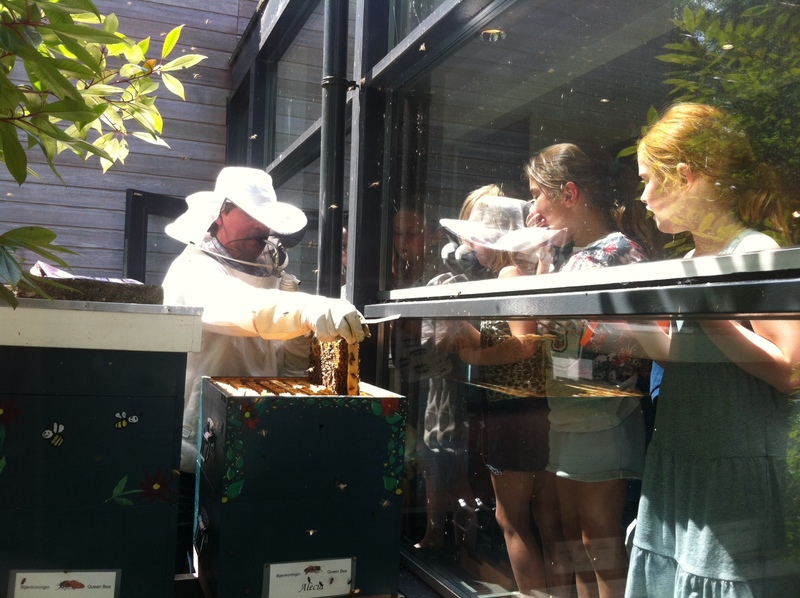 When we started with the project, there were worries that the bees could potentially annoy our guests. But none of that ever happened. You would be surprised how little the bees care about humans even when standing right next to the hive. If it wasn’t for us promoting our own honey, guests wouldn’t even take note of the fact that we have a colony of bees living on our roof. It’s been over two years now and we haven’t received a single complaint. On the contrary. The projects all started in 2012. Alongside the Hostel was a small pile of sand. The employees came up with the idea to make a Butterfly flower garden from the pile. We wanted to help the butterflies and bees which have a hard time surviving. We came in contact with Butterfly Foundation. Together we started to redesign the gardens to fit needs of the local butterflies and bees. We also decided to contact the local beekeepers Association. They were willing to place a hive but they wanted a bee keeper present at all times. Stayokay aims to play a leading role in the field of accommodation and catering, but it also aims to contribute to society on an ongoing basis with full conviction. We try to make our guests aware of our surroundings. Stayokay Haarlem wants to play an active role now and in the future. The complete Stayokay Haarlem Staff and especially beekeepers Falco, Emiel, Ivan and Lorenz, Beekeepers Association Haarlem and the Dutch butterfly Foundation. How did you get the hives? Did you build them? Did you buy them? 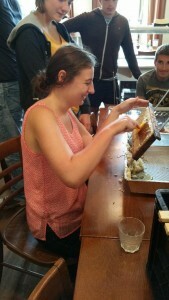 The beehives were carefully hand-crafted by a carpenter in retirement Gé, father of the hostel manager. The hives are chemical free and painted with bee friendly paint. He has manufactured 9 beehives. They all include a special designed anti-Varroa mite bottom, 2 incubation chambers, a honey chamber, a cover plate, a special Queen grid, and lid to cover everything up. Which hostel(s) participate in this project? Are you planning to involve more? At this moment only Stayokay Haarlem has honey bees. Our future beekeeper Lorenz also works at Stayokay Vondelpark Amsterdam and, if possible, wants to place bees on the roof. 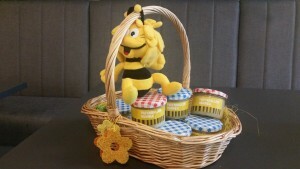 Our own Honey! The butterflies and bees played an important part in winning a local sustainability award called “Groene Mug” (“Green Mosquito”) organised by the city of Haarlem. The award is intended to encourage sound sustainability initiatives. Winning the award generated € 85.000 printed media value only in just one month. After winning the award we were invited to present Stayokay Haarlem and how runs its business in an environmentally friendly fashion in several sustainability events in Haarlem and Amsterdam. Have you noticed a change in the surrounding flora since you started the project? Yes we did. The species diversity in the gardens has increased almost tenfold. That depends on the quantity of flowers and temperature and differs every year. Last year the yield was about 30 kilograms per hive. 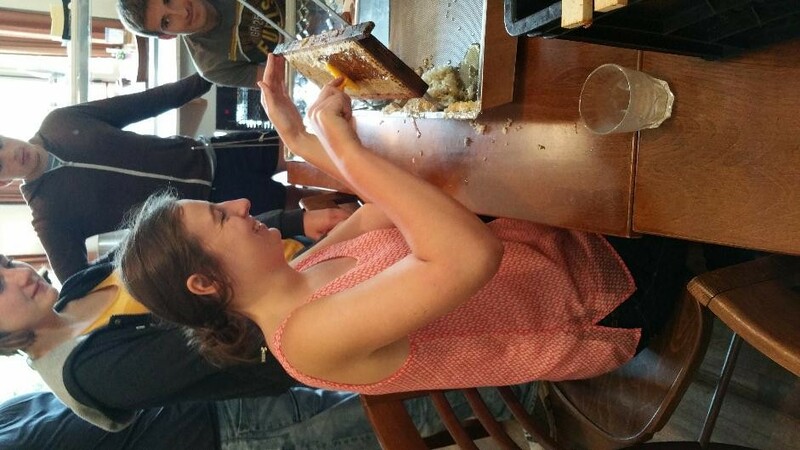 2015 was a very poor year with only 8 kilograms per hive. In the park behind the hostel, the Beekeepers Association Haarlem has 10-20 hives especially for the beekeeper course. The surplus honey is sold at Stayokay Haarlem. We place a high priority on corporate social and durable responsibility. Stayokay Haarlem respects the environment and society. This is why Stayokay Haarlem runs its business in an environmentally friendly fashion. All waste is segregated, power is green, biogas, printed materials are recyclable, meat served is produced animal friendly, coffee is fair trade. More important: Stayokay Haarlem has achieved a reduction of 98% in cleaning chemicals. This means that about 250 gallon of heavy chemicals witch are not dumped into the sewer. Stayokay Haarlem uses special enzymes and algea for cleaning. From the international community and small farm workers themselves (the bees! ): a honey-sweet thank you!